I have a GSD (Katlynn) she is 5 years old - we love her. She is great when we go places. we have one problem when she is in the back yard that is fenced in - she will not come in when we ask her. We have to have her on a 20 foot leash if we do not we play catch me if you can. we played this game with her several times and she will only come in when she want to not when we want. But other than this one problem she is great. When we take her places around kids and other dogs. Total German Shepherd: It's easy enough to train your dog to play "keep away" without even meaning to but can be much harder to break this habit. Training is the only way you'll be able to do this. 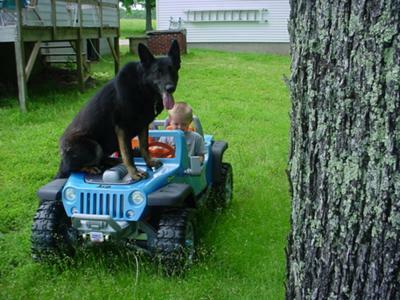 You can sign your German Shepherd up for dog training classes, or you can hire a trainer to do it for you or you can get a course and do it yourself. Either way, dog training is needed to break this habit and to get your German Shepherd to follow your directions such as "come inside". First I'd suggest signing up for an actual german shepherd dog training course if at all possible - it's great for socialization and it's good to get your dog out around others and to have a good dog trainer helping you can be invaluable.